There are more than two million groups on LinkedIn. 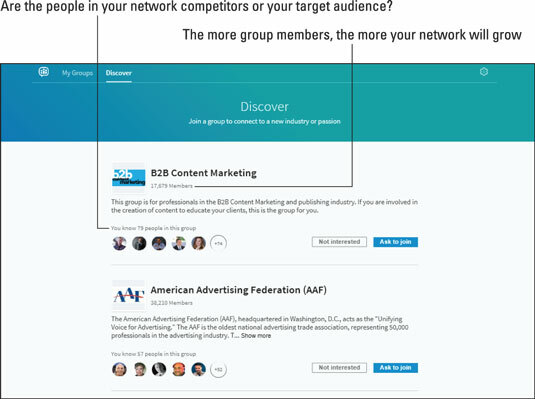 Search LinkedIn to find groups that match your target audience and interests or allow LinkedIn to recommend groups to you. LinkedIn looks at commonalities you share with members of different groups such as companies, schools, or industries. Those groups with members that share the most attributes with you are presented as groups you might want to join. Hover your mouse pointer over Interests located in the menu bar at the top of the screen and then click Groups. The My Groups page opens. This is where you see all of the groups you have already joined. Click Discover on the lower menu bar. The Discover page opens. This is where LinkedIn recommends groups to you. Scroll through LinkedIn’s recommended groups, and if you see a group you would like to join, click the Ask to Join button. Notice the total number of people in the group. The larger the number, the more your network expands when you join. Also, LinkedIn shows you the number of people you know within the group. Are these people your target audience or are they competitors? If they are competitors, you may choose not to join the group. LinkedIn recommends groups you might be interested in.